German Equatorial mounts are recognized for their rock solid stability, simple balancing and easy accessibility for attaching accessories. With sophisticated software features like the Hibernate function, the CGEM DX can maintain its star alignment night after night without needing to be re-aligned, making it an excellent choice for a permanent observatory facility. Innovation - The CGEM DX series has a new innovative Polar alignment procedure called All-Star™. All-Star allows users to choose any bright star, while the software calculates and assists with polar alignment. Another great feature of the CGEM DX sure to please astroimagers, is the Permanent Periodic Error Correction (PEC) which will allow users to train out the worm gears periodic errors, while the mount retains the PEC recordings. The EdgeHD optical system takes all of the compact power popularized by the Schmidt Cassegrain Telescope (SCT) and combines it with an improved high definition optical system for wide field, astrograph quality images. As a visual instrument, EdgeHD optics deliver pinpoint images even with your widest field eyepiece. You can search for all of the Messier Catalog objects, and see hundreds of other equally interesting NGC, IC and Caldwell objects with amazing clarity. For astroimaging, the EdgeHD optics produce aberration-free images across your favorite CCD or DSLR camera. All EdgeHD optics are designed to produce an extremely flat focal plane precise enough to match the strict tolerances of the largest commercial CCD detectors, allowing all stars to be in tight focus to the very edge of the chip. 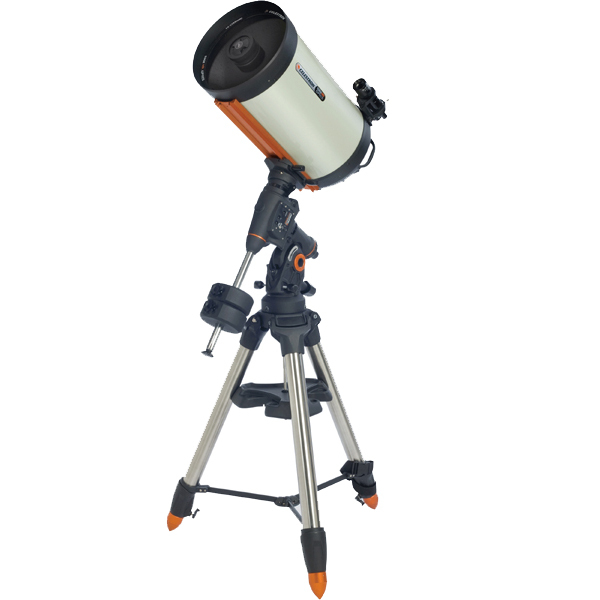 82° Eyepiece - EdgeHD 14" optical tubes come with Celestron's top of the line 2" barrel eyepiece. With a 23 mm focal length and 82° AFOV, you get an incredible combination of power and wide field of view. Plus this 6-element eyepiece is optimized to deliver pinpoint images when used with a flat field telescope.